By hungry runner on October 3rd, 2010 . Filed under: Artwork, Cupcake Ideas, Stationary . Flowers In May, a design and stationary company was launched in 2007 by Massachusetts based graphic designer Emily Dumas. 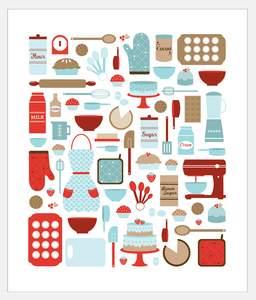 In the “about” section of her website it mentions that she enjoys baking cupcakes which explains two of her prints. 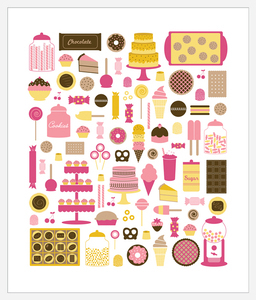 One print, titled The Best Things In Life Are Sweet, is an 11×13 print of all things sweet, including cupcakes! Another print which shows Dumas’s passion for baking is named, Today I Feel Like Baking, and a little cupcake can be found hidden amongst the baking necessities. Prices for prints range from $15 to $25 and look around her website to view the other products she offers.